Contents / Gift Items shown in pictures are not included. Doubles as a coin bank too! Puzzle Pod is an ingenious, unique, and fun way to deliver a gift by means of a brain teaser puzzle....and a good way to taunt someone. With a coin slot, it's also doubles as a money bank. You set your own personalized combination - a five letter code word. Lock your wrapped or unwrapped gift inside, and then send someone on treasure hunt adventure, Da Vinci Code style. Instead of just the typical gift, create a stimulating intellectual challenge for your friends, family or coworkers to test their code breaking skills. They won't get your gift until they figure out the solution. It makes a unique corporate or client gift too. Take one to the office and see who can break your code and win a mystery gift or get access to the candy inside. Call, email, or text your clues daily, weekly, or monthly. Length of the game is up to you. Could a clue be on a billboard, street sign, song titles or lyrics, book tittles or passages, hidden on a hiking trail, spelled out in white coral on lava rock somewhere in Kona,HI. Maybe clues lie with various people - relatives, coworkers, etc? Use your own creativity to deliver the clues. 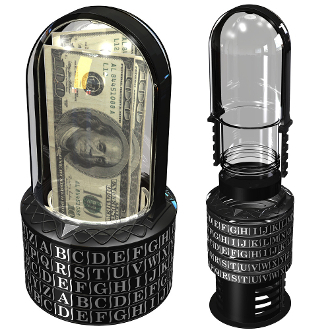 The size of the bottle allows many items to be inserted such as candy, money, toys, gift cards, smart phones, jewelry, watches, concert, theater and sporting event tickets, and more. Besides the easy to read instrucitons included for resetting the code, the website has step by step video instructions as well as a Code Bank of potential five letter words you might consider for use.